In a plot of just one-third of an acre wide in Madison’s Forest Hill Cemetery, the U.S. military interred the remains of 240 Union soldiers who died while under care at the town’s hospitals. 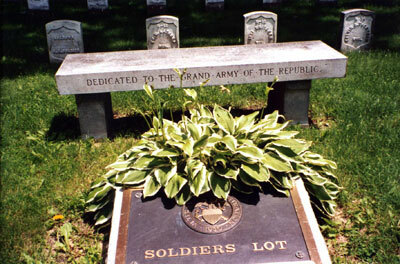 The soldiers’ lot in Section 34 also contains the remains of veterans from the Spanish-American War and World War I, and the graves of eight children orphaned during the Civil War. The 140-acre cemetery’s natural landscaping and curving pathways are typical of rural cemetery design, common in the 19th century. The city of Madison established Forest Hill Cemetery in 1857. The site chosen consisted of 140 acres east of downtown on a rise overlooking the city and the Mendota, Monona, and Wingra Lakes. Forest Hill Cemetery is an early example of rural cemetery design, evident today in its curving drives, which follow the natural contours of the land, and plantings of trees and other greenery to enhance scenic vistas. More than 1,000 years ago, late Woodland period Indians constructed burial mounds in the area of the cemetery. Several mounds, one in the shape of a goose, are located on the southern edge of the cemetery in Sections 15 and 35. Although far from the front lines, Madison played an active role during the Civil War. The city hosted Camp Randall, a Union army training facility. Similar to other training camps in the Great Lakes region, the army established a prisoner-of-war camp for Confederate soldiers. The army also established a military hospital at the camp. Soldiers who died in the military hospital and Madison’s general hospital were interred in a lot on the southeast corner of the Forest Hill Cemetery. Although burials in the lot started in 1862, the Federal Government did not acquire the property until 1886 when the city of Madison donated the land. The soldiers’ lot contains the remains of 240 Union soldiers as well as veterans of the Spanish-American War and World War I. Eight children are also buried in the soldiers’ lot. After the Civil War, the Soldiers’ Orphan Home cared for children of Union soldiers orphaned during the war or whose parents could no longer care for them. Eight children died while living at the home, and their remains were interred in Forest Hill Cemetery’s soldiers’ lot. In 1873, a marble obelisk was erected in the lot dedicated to the eight children, with each of their names inscribed on it. Confederate soldiers are also interred in Forest Hill Cemetery in a section known as Confederate Rest. The majority were soldiers who died while held in the prison at Camp Randall. The lot contains the remains of 140 Confederate troops and is located north of the Union soldiers’ lot. Unlike the Union soldiers’ lot, however, Confederate Rest is not owned or maintained by the Department of Veterans Affairs. Another veteran section, located near the burial mounds, contains veterans from the Spanish-American War and later conflicts. This section is also unaffiliated with the Department of Veterans Affairs. The cemetery contains the graves of numerous Wisconsin politicians, business leaders, and other prominent citizens. Archeologist Charles Brown served as the director of the Wisconsin Historical Society and conducted numerous surveys and investigations on burial grounds in the Madison area, including the goose-shaped mound in Forest Hill Cemetery. Inventor and scientist John Bardeen, inventor of the transistor, is buried in the cemetery, as is William Freeman Vilas, who served as Secretary of the Interior under President Grover Cleveland. The Forest Hill Cemetery Soldiers’ Lot is located within Forest Hill Cemetery, at 1 Speedway Rd. in Madison, WI. Wood National Cemetery oversees the soldiers’ lot; the administrative office is open Monday to Friday from 8:00am to 4:30pm. The office is closed on all Federal holidays except for Memorial Day. For more information about the soldiers’ lot, please contact the national cemetery office at 414-382-5300, or see the Department of Veterans Affairs website. Forest Hill Cemetery is open for visitation daily from sunrise to sunset. The cemetery’s administrative office may be contacted at 608-266-4720. While visiting, be mindful that our national cemeteries and soldiers’ lots are hallowed ground, and be respectful to all of our nation’s fallen soldiers and their families. Additional cemetery policies may be posted on site. 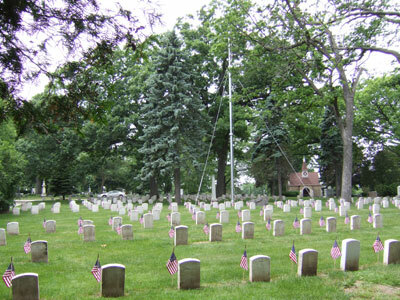 Forest Hill Cemetery Soldiers' Lot was photographed to the standards established by the National Park Service’s Historic American Landscapes Survey.